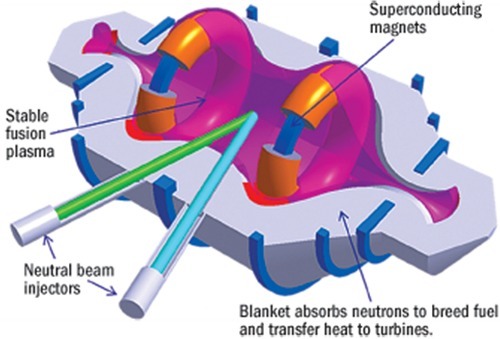 The compact fusion reactor seems to have suddenly leapt into the news pages of nuclear fusion energy as well as scientific and general media. Almost breathless announcements of cheap workable energy within five years seems the tenor of many headlines. How real is this? What is actually happening? Many with any knowledge of nuclear fusion physics have been somewhat sceptical of the headlined time frame. Yet here is Lockheed Martin, a respected, large aeronautical development firm announcing this development. Also it it is a child of of their trademarked Skunk Works program. Beginning in 1943, Skunk Works, whose name arose as a variation on a Lil’ Abner saying, has been the rapid developer of many new ideas. Given a lean, confidential, nearly autonomous team, with highly focused goals results can be achieved quickly. 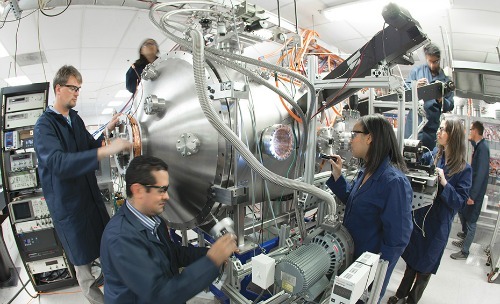 The Lockheed Martin Skunk Works program Compact Fusion Reactor under construction. Tom McGuire on the left. Images courtesy of Lockheed Martin through Aviation Week. This energy generator grew out of ideas developed by Tom McGuire. With a bachelor degree from Penn State University and PhD through MIT he studied aeronautical and aerospace technology focusing on electrostatic confinement fusion. After only a few months post-doctoral work at MIT, he was hired by Lockheed Martin, working there since November 2007. He relates having been fascinated by nuclear fusion, its years of research and developments. He attempted to construct a synthesis of systems that have been tried to achieve a workable outcome. Less than a couple of years before the latest announcements, Charles Chase presented a Solve for X presentation about developing worldwide abundant clean energy with 100MW reactors utilising deuterium and tritium fuel. Charles mentions the features of the new device with a high beta of plasma pressure to magnetic containment. At a ratio value of around one, at least ten times higher that a tokamak reactor, it can be built a lot smaller. Minimal areas for particles to escape and an effective plasma curve configuration were additional factors that should aid the design effectiveness. Now Lockheed Martin have a page on their website that contains a further brief video about the concept. Fronted this time by Tom McGuire, we find that he has driven the project from the beginning. He shares ideas of a possible time frame for the development. We see some tantalising images of what the apparatus might look like. Even a cursory listen to the video gives a somewhat different perspective than the headlined ones on the timeline for the compact fusion reactor. With its small size, no doubt also helped by a fairly substantial budget which large defence supplier companies can muster, he expects rapid iterations of the device to be achieved. Even so he talks of five years to proof of concept. 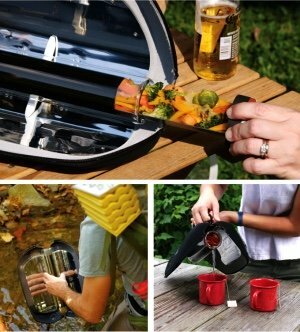 That is a workable device. Then five more to something with military applications and twenty to helpful world power generations. Naturally there have been a number of comments about the skewing of priorities that appear with these timelines. All this depends on whether each step of the project produces results as expected. This is not the usual outcome of nuclear fusion initiatives. Particularly where fixed containment of plasmas is involved. Aviation Week was the chosen media to initially release the latest information. Their images have been replicated by others. They give us some idea of the designs as does the latest company video. What is the design actually like? Some static images on the Lockheed Martin website show an apparatus looking very similar to the MIX device that I have covered under the FPGeneration device. Its origin is in electrostatic confinement fusion. Tom McGuire himself says his idea has similarities to that of Bussard’s Polywell fusion device, another electrostatic confinement device. In the video there are annular super-magnet tubes visible that look very similar to the Polywell construction. But they are being adjusted within a large metal cylinder (also mentioned previously by Charles Chase) that would seem to suggest field reversed configurations favoured by Helion Energy and the secretive, well-funded Tri Alpha Energy project. Tom does say he has meshed several ideas to direct his research. It may well be this is the combination he favours. An interesting departure from these initiatives though is his and earlier statements that the fuel will be deuterium and tritium. As noted before this is the easiest fuel to obtain a sustainable nuclear fusion reaction from. It demands plasma at the lowest possible temperatures. The other devices he seems to have based the compact fusion reactor on have preferred to aim for an aneutronic fusion process with boron and hydrogen fuel which requires much higher ignition temperatures. Neutrons are generated from the deuterium and tritium fuel. Being non-charged particles they cannot be contained by electromagnetic fields. They will be used most likely to interact with a lithium blanket (as in the diagram) to generate more tritium fuel. Some will also reach the chamber walls. Shielding will need to be in place to cope with deeper penetration. Similar to a number of other devices out there, from the diagram it appears there will be provision for injecting further neutral beams of neutrons. Plasma energies can be adjusted while the compact fusion reactor continues operating. Wall interactions, Tom tells us, is what will drive power generation. The high energy particles along with the energy from fusion reactions will heat the containment walls. This heat will be harvested to drive turbines to produce electricity. As such they could be bolted in to current gas to electricity plants to produce electricity without further infrastructure requirements. For those places without such generating plants available new turbine generating facilities will need to be constructed. I rather bagged Amory Lovins of the Rocky Mountain Institute for commenting on how costly this full infrastructure to produce energy from fusion is. He pointed out that it is more expensive than other renewable energy options we already have available. My contention was there were a number of fusion projects in development that did not require turbines to produce power. 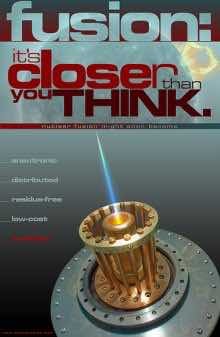 But Lockheed Martin’s compact fusion reactor will need them. Cost will be an issue. The Lockheed fusion devices are proposed to power ships, planes and spacecraft. Yes, if they can be built at such a compact size - noted as 2 metres by 4 metres (6 feet by 12 feet) - they could readily be placed in such large vehicles. Yet neutron interaction with wall materials will alter the integrity and longevity of the structure. Regular inspection and timely replacement will be required. 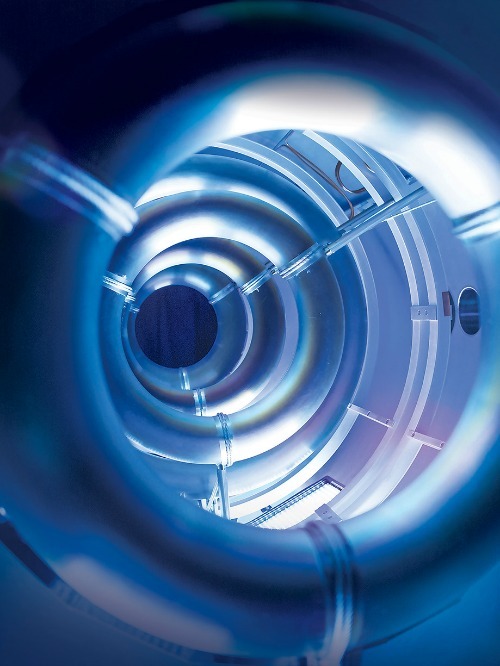 The timeline for the Lockheed's compact fusion reactor is still significant. Yes it is much shorter than the astronomically costly, multinational ITER project. But there are a number of initiatives out there which could produce effective results in a shorter timeframe. Some are even smaller than the Lockheed fusion device. They are also aiming at aneutronic fusion with effectively no radioactive waste. Although deuterium and tritium fusion produces relatively short half life radioactive by-products they still need to be dealt with. Likely this will require more than just “burying them in the desert for a hundred years” as was casually suggested. The compact fusion reactor may well achieve its results in the time frame suggested. It is just a little longer and comes with a few more fishhooks than rosy-sounding headlines would seem to suggest.